Music is personal to each and every one of us, and there is a common misconception that you must be ‘musical’ to participate in music workshops – this is definitely not the case. Music can be a vital component in a companies’ team building programme. Soundwell’s sessions use music to build confidence and morale so that tasks can be undertaken more efficiently and collaboratively in the work place. Soundwell can offer group and/or individual sessions either in the workplace or in a non-work environment by highly-skilled qualified music therapists, designed around your needs. Sessions can include: choir, drumming workshops, body percussion, percussion instrumental workshops. 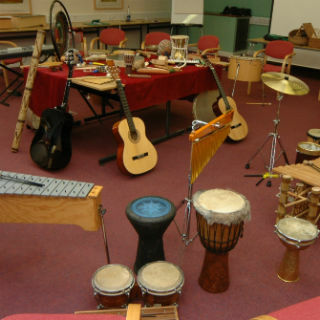 Our multi-cultural instruments include a range of African drums, lyre, gongs, symbols chimes, accordions, guitars, keyboards. Our music technology includes apps such as ‘garage band’ and ‘thumb jam’ (apps which turn iPads and iPhones into an amazing collection of touch instruments and garage band enables a full-featured recording studio to put sounds together). Contact enquiries@soundwell.org.uk for more information.